How to see Paris in a Day | Cooking Wine And Travel - The site where Foodies Unite! 1) First stop: The Louvre You can spend a week at the Louvre and not see it all. We hired a private tour guide through our hotel concierge and he took us through all of the "relevant" works in about 3 1/2 hours. It was well worth the $250 EURO we paid him. The Louvre was built by Philippe Auguste in 1204 and was originally the royal château and later transformed by Charles V between 1364 and 1380 and was entirely rebuilt from the time of Fran�ois I to the 19th century. Once upon a time a palace of French kings and princes, the Louvre is today the Palace of Arts and holds one of the richest museums in the world. Its collection, which ranges from Egyptian art of 5000 BC to nineteenth-century work, is divided into seven departments: Oriental and Islamic Antiquities; Egyptian Antiquities; Greek, Roman and Etruscan Antiquities; Painting; Sculpture; Decorative Arts; and Graphic Arts. The most relevant piece of art is the Mona Lisa. If you get there early you can avoid the lines. 2) Second Stop: Take a cab to the Isle of Saint Louis. Ask to be dropped off in the middle of the island. Ile Saint Louis is a little island and is so charming, a haven of peace in the midst of the city. Wander among cobblestone streets, and admire the 17th and 18th century townhouses. Visit the many art galleries and tea-rooms, and sample some of the best ice-cream in the world chez Berthillon. Karen and I took a cab to the opposite end of the island from Notre Dame. We walked the streets, had lunch at an outdoor caf�, and then walked across the bridge to Notre Dame. 3) Walk across the bridge to Notre Dame, on the Ile de la Cit� : Perhaps the most famous church in the world! 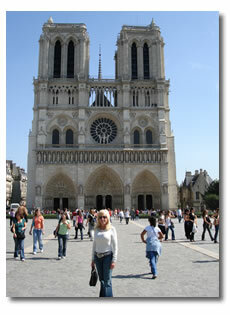 This wonderful cathedral is full of hidden secrets, spectacular architecture, symbols and mystery. 4) On the same Island and just down the street from Notre Dame is the The Sainte Chapelle: A true gem of Gothic architecture located about one block from Notre Dame. This XIIth century chapel hidden away in the courtyard of the French Palace of Justice has the most impressive stained glass windows in Paris. If you are up to it, you can attend one of their evening classical music concerts. The church is famous for its fabulous acoustic qualities. 5) Take a cab to the Eiffel Tower: built at the beginning of the XIXth century for the Paris World Fair,this "Demoiselle de Fer" was the subject of much controversy when unveiled to the public. 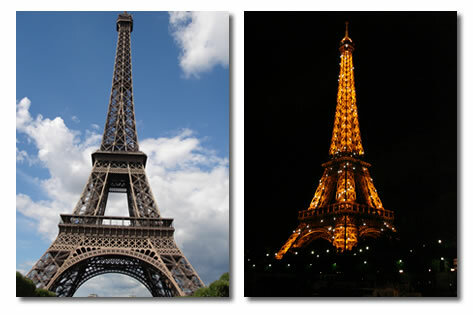 Now, the most visited monument in the world has become the very symbol of France. You can skip the long lines by making a reservation in advance at the Jules Verne restaurant which is about 1/3 the way up the tower. You can get a VIP pass from the Maitre D´ to go to the top. The lunch is very expensive! There is also a wonderful park behind the tower that is fun to hang out in and watch people. 6) Go shopping on the Champs Elysees: Walk across the river and head east towards Ave George V. Follow Ave George V to the Ave des Champs Elysees. This is the main shopping district. Your hotel is just north of the Charles Degaulle monument that sits at the end of the Champs Elysees. After dinner, I recommend grabbing a good bottle of wine, wine opener and some glasses/cups and taking a night time boat cruise on the River Seine. You need to sneak the wine on and sit on the very top of the boat. The lights at night are amazing and you will see everything listed above in all its glory. - Boat Cruise: Bateaux Mouches, Bateaux Parisiens and Vedettes du Pont Neuf are the main companies for riverboat cruises. The tours last one hour, and advance reservation is unnecessary. The boat cruises are especially lovely at night. I recommend you do this at late at night and sneak a bottle of wine in your bag. - Rue Mouffetard : behind the Pantheon, on the left bank, and close to the famous Gobelins factory, this small street has a very typical food market, and excellent wine, cheese and pastry shops. (Rue de Buci and Rue Clerc are other locations for nice food markets). This is a great stop to prepare for any picnics. - Visit the "Passages Parisiens": these covered streets were built in the XIXth century. There are many intersting and unusual stores to see, along with their fascinating architecture. - Purchase Antiques at the Flea Market of Clignancourt (the largest covered flea market in the world) or the Chic Carr� Rive Gauche, not far from Saint Germain des Pr�s, and the Latin Quarter. -Shopping at the Latin Quarter: The Latin Quarter is bisected by the Boulevard St. Germain and the Boulevard St. Michel. These are the two main arteries running through the area, with the hundreds of crooked streets leading off them like capillaries. The tree lined Place St. Andr� des Arts, which was a gathering place for many French artists, is still ringed with bistros and restaurants. Walk up St. Michel until you reach the intersection of Blv. St. Germain. The two streets intersect near the Cluny Museum on Boulevard St. Michel, a museum well worth visiting. - Montmartre: This is a small village (and former artistõs colony) on a top of a hill located at the highest point in Paris with a fine view of the city There is a walking area full of small streets, caf�s, galleries, and the unique òSacr� Coeuró (Sacred Heart chapel). Make sure you take a picnic lunch and bottle of wine and eat on the grassy hill over looking Paris. It is about a 45 min cab ride from the center of the city. Musee dõOrsay: Built in the year 1900 by Victor Laloux, this train station was meant to service the Orleans line. Unfortunately, the line ceased because the platforms were not long enough. After being used for a variety of purposes, the whole building was entirely refitted inside and transformed into an art museum covering the period from 1850 to 1914, with an area of 50 000 m2. The conversion of this abandoned train station, the Gare d´Orsay, into the Musee d´Orsay marked a major advance in the reorganization of the different collections. The museum is devoted to all art forms from the second half of the 19th century (painting, sculpture, architecture, music and items trom everyday life). Significant Impressionist and neo-lmpressionist works are on display, as well as the creations of the more conservative academic school that was also known as Pompier in France. Art-Nouveau objects and blue-prints complement the collections. Jacquemard-Andre Museum: Built by wealthy art collectors Edouard Andre and Nelie Jacquemard , the Jacquemard-Andre Museum is one of the best kept secrets in the Paris museum world. A spectacular turn of the century private mansion, the museum includes important works of French, Italian Rennaisance, and Dutch works of art. Indeed, the collection is so complete and impressive that the former residents bragged about never having set foot in the Louvre museum! Musee Picasso: The Picasso museum is housed in one of the nicest mansions of the Marais district in Paris, built in the XVIIth century for Pierre Aubert Lord of Fontenay . The Hotel Sal� which owes its name to the profession of its fist owner (a salt tax collector), changed hands very often, becoming a national literary repository harbouring the convent libraries seized during the Revolution, an educational establishment where Balzac completed his secondary schooling, the Ecole Centrale des Arts et Manufactures, an exhibition room for the bronze sculptor Henri Vian etc It was made a listed building in 1968, and opened his doors as The Picasso Museum in 1985 . Devoted solely to the artist, the museum provides a unique opportunity to follow Picasso´s development throughout his career, from 1894 to 1972 . Pompidou Center: Officially inaugurated in the beginning of 1977, the Art Center is unique in Europe and rivals the best-adapted centers in the United States. It is devoted to every form of contemporary art. The Pompidou Center is divided into five floors : Temporary exhibitions in the Grande Galerie on the fifth floor; Museum of Modern Art from 1905 to present time on third and fourth floors. The huge public library covers three floors with books, video-discs, microfilms, videos.. Don´t leave before taking a ride on the escalators. As you go up, you will discover Paris skyline : the Sacr�-Coeur, St-Eustache, the Eiffel Tower, Notre-Dame, the Panth�on, the Tour St-Jacques, and La D�fense. From the platform at the top you can look down on the ch‰teau-style chimneys of the H™tel de Ville, with their flowerpot offspring sprouting over the lower rooftops. Versailles: Versailles used to be a small hamlet deep in the woods, where Louis XIII, the father of Louis XIV, had asked for a small castle to be built because he loved hunting. Then, this small castle grew to become ´The Chateau de Versailles´ and the original castle can still be seen around "la Cour de marbre". Versailles is more than a Palace surrounded with beautiful gardens. It also has a huge park where one can discover two small castles names Grand and Petit Trianons, former summer residences for the Kings who loved to rest and forget about the "Etiquette" of the Court. Located about a half hour driving distance from Paris, we may organize either a professional English speaking professional guide, or you may also have a tour by yourself. Transportations can also be organized from the Hotel with a private car and driver. Fontainebleau: This is a one-hour drive from Paris with interesting spots such as the castles of Fontaibebleau and Vaux-le-Vicomte. Fontainebleau was a royal residence from Fran�ois Ier until Napoleon III. Vaux-le-Vicomte was the property of Fouquet who was in charge of finances at the time of Louis XIV, and the beauty of the place made the King so jealous that Fouquet was put in jail for the rest of his life and Louis XIV created Versailles. Champagne: The Champagne region is at about 1 hour and a half before arriving in Paris. Champagne´s Fizz draws wine lovers to the sacred triangle between Reims, Epernay and Ch‰lons-en Champagne, but the region also attracts culture lovers to its great churches, notably Reims Cathedral.